President Barack Obama pledged during his January 2013 State of the Union address that the United States would join with its allies to “eradicate” extreme poverty over the “next two decades” by connecting more people to the global economy and empowering women. Putting an end to extreme poverty requires providing opportunities for all individuals, especially women, to thrive through education, nutrition, and health. In order to achieve this goal, a greater emphasis must be placed on gender equality and the removal of barriers that disproportionately affect women. A great deal of progress has been made in the fight against poverty, particularly since the adoption of the U.N. Millennium Development Goals, or MDGs, in 2001. From 1990 through 2008, the number of people worldwide living in extreme poverty fell by more than 800 million. Yet barriers to prosperity still remain—such as inequality and discrimination against marginalized populations—and new challenges continue to emerge that impede goals to reduce poverty. Approximately 1.3 billion people still don’t have access to electricity, and overcoming the lack of reliable sources of energy is an absolute hurdle to getting out of poverty. Other threats to the economic well-being of individuals and families—including climate change—endanger development gains and threaten to reverse them. And where there has been measurable progress alleviating poverty, that progress has been uneven: The most disadvantaged and poorest of the poor have not received the same benefits of development. While the poverty rate has declined in many developing countries, much of that improvement has been concentrated in China. Worldwide, rural populations, ethnic minorities, the disabled, and women have not benefitted from the rising economic tide. From a global perspective, women own only 1 percent of property, earn 10 percent of all income, and yet they produce half of the world’s food. 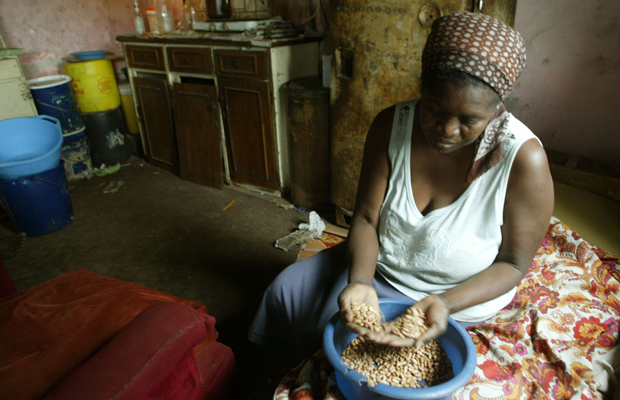 Any poverty agenda must focus on women because they are 70 percent of the world’s poor. 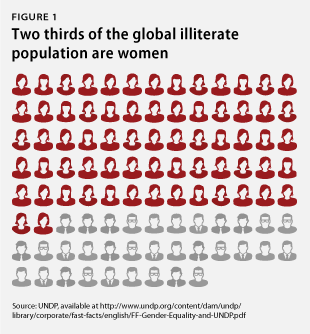 Women comprise two-thirds of the global illiterate population and all women face additional hurdles to their economic and social well-being, including the pay gap and the fact that women are much more likely to hold vulnerable jobs. Because women constitute the majority of the world’s poor and because development goals have not been achieved—particularly where gender inequality thrives—women’s empowerment and gender equality must a focus of the U.N. development agenda beyond 2015 when the Millennium Development Goals are set to expire. The expiration of the Millennium Development Goals and the development of new Sustainable Development Goals are stimulating global conversations about how to address poverty and sustainable development. This issue brief looks at gender equality and women’s empowerment in the post-2015 U.N. development agenda framework. The vital role of women in sustainable development has long been recognized. The 1995 Beijing Declaration from the United Nations’ Fourth World Conference on Women and the 1992 Rio Declaration recognized that empowering women is essential to sustainable development. Yet gender discrimination continues to be a key driver of poverty. The Millennium Declaration listed fundamental values: freedom, equality, solidarity, tolerance, respect for nature, and shared responsibility. It also listed the following key objectives: peace, security, and disarmament; development and poverty eradication; protecting the environment; human rights, democracy, and good governance; protecting the vulnerable; meeting the special needs of Africa; and strengthening the United Nations. Global gender discrimination gained further attention when the U.N. General Assembly considered a new agenda for addressing global poverty in the beginning of 2000. The Millennium Development Goals were introduced in September 2001 after a mandate by the U.N. General Assembly for its secretary-general to prepare a roadmap on how to implement the Millennium Declaration that was agreed to in 2000. 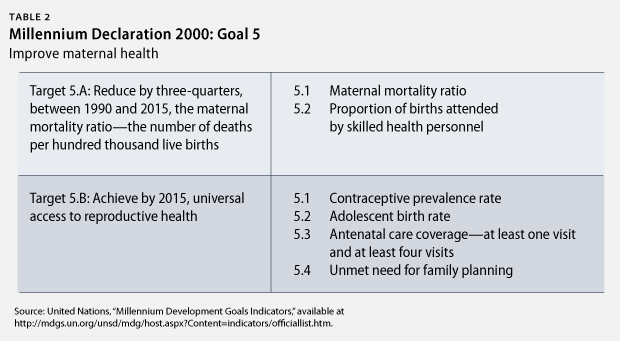 While the Millennium Development Goals stimulated investments, improved measurements of inequality, and informed ways to accelerate progress, not all of the goals are on track to be fulfilled, including two gender-related Millennium Development Goals: Goal 3—which aims to promote gender equality and empower women; and Goal 5—which pledges efforts to improve maternal health. The average gap in primary education has been closed, however, disparities persist regionally and the poorest girls are not enrolled in school. There has been little progress in secondary and tertiary education gender parity since the 1990s. Women’s employment outside the agricultural sector increased from 35 percent to 40 percent between 1990 and 2010, but women’s participation in the labor market lags behind men, regardless of education and skills. Thus Millennium Development Goal 3 has not been achieved. A lesson learned from the Millennium Development Goals is the need to focus on the underlying barriers of educating young women and making opportunities available to women. “Progress towards the MDG 5 target to reduce maternal mortality has been very slow. The target will not be met within the timeframe set. Nor can it be said that universal access to reproductive health has been achieved.” Helen Clark, administrator of the United Nations Development Programme, remarks at Harvard University, January 2013. Progress on MDG Goal 5 also has not kept pace with global trends. The prevalence of contraceptives worldwide has increased since the 1990s but the expansion of contraceptives has slowed and remains low among the poorest and uneducated women. In half of the 48 countries in sub-Saharan Africa where data is available, the rate of contraceptive use is under 20 percent, according to a 2009 U.N. report. The reduction in the adolescent birth rate, which is perpetuated by poverty and lack of education, has also progressed at a slow pace. Wealth and geographical gaps also impact the availability of prenatal and maternity care such that wealthy urban women are three times more likely than poor rural women to have skilled assistance during delivery. Only one in three rural women in developing regions receive adequate prenatal care. Inadequate funding for family planning is a major impediment to women’s reproductive and maternal health, yet the need for these services remains high in most regions, especially in sub-Saharan Africa where one in four women in relationships desire contraceptives but do not have access to them. The global development agenda should seek not only to address and monitor the elimination of specific gender gaps, but also to transform the structural factors that underpin the widespread persistence of gender inequalities, gender-based violence, discrimination and unequal development progress between women and men, girls and boys. The empowerment of women and girls and the protection of their rights should be centre-pieces of the post-2015 agenda. The U.N. Secretary-General’s High-level Panel on Global Sustainability, co-chaired by the former Finland President Tarja Halonen and South Africa President Jacob Zuma, was meant to be one input feeding into various international bodies and forums, including the U.N. Conference on Sustainable Development, or Rio+20, and the United Nations Framework Convention on Climate Change, or UNFCCC, and the post-2015 development agenda. U.S. Ambassador to the United Nations Susan Rice was appointed to be the U.S. representative on the panel. Any serious shift towards sustainable development requires gender equality. Half of humankind’s collective intelligence and capacity is a resource we must nurture and develop, for the sake of multiple generations to come. The next increment of global growth could well come from the full economic empowerment of women. The panel recommended that governments repeal discriminatory laws and reform institutions and cultural practices to ensure that women have equal access to jobs, markets, reproductive and health services, and property. It also recommended that women have an equal role in decision-making processes. Transformative change will require recognizing and tackling both manifested gaps and their structural causes, including discrimination and exclusion, widely faced by women and girls, persons with disabilities, older people and members of indigenous and minority groups. Some of the key obstacles to women’s empowerment, as outlined in the document, are threats and acts of violence against women. In “The Future We Want,” the elimination of all forms of violence against women and girls is recognized as integral to development. The prevention and reduction of all forms of violence and abuse—and protection against their specific manifestations, including trafficking in human beings, torture, organized crime, the press-ganging of children, drug-related criminality, sexual abuse and labour exploitation—should be at the heart of any agenda which fully recognizes the centrality of human security, both as a human rights imperative and as integral to development. Michelle Bachelet, executive director of UN Women, speaking on gender equality and the post-2015 developmental framework at a conference in Dublin, Ireland, said, “There is no country in the world where women and girls live free of the fear of violence. No leader can claim: This is not happening in my backyard.” According to Bachelet, between 40 percent and 50 percent of women in the European Union report being sexual harassed at work. In some countries, up to 70 percent of women will suffer violence in their lives, and one in three women worldwide will experience sexual violence in their lifetime. “As long as women face violence and discrimination, our efforts to eradicate poverty, achieve equality, and advance human rights and democracy will not succeed,” said Bachelet. According to UN Women, “As many as 7 in 10 women around the world report having experienced physical and/or sexual violence at some point in their lifetime.” Statistics from a United Nations Economic and Social Council report on the status of women indicate that violence against women and girls is a universal phenomenon, irrespective of income, class, and culture. Because the Millennium Development Goals will expire in 2015, the United Nations has now begun the process of evaluating them and deciding whether to renew or rework them. After several reports were published on the current state of achieving the goals, U.N. Secretary-General Ban Ki-moon last July created a High-level Panel on the global development agenda for the period post-2015. The panel is tasked with providing recommendations on continuing the U.N. global development framework. The High-level Panel is being chaired by Liberia President Ellen Johnson Sirleaf, Indonesia President Susilo Bambang Yudhoyono, and U.K. Prime Minister David Cameron. The panel is comprised of 27 leaders from civil society, the private sector, and government. To date, the panel has convened three times—September 2012 in New York at the opening of the U.N. General Assembly; November 2012 in the United Kingdom; and most recently in Monrovia, Liberia, in January 2013. The panel’s final report is expected to be released at the end of May 2013 at the conclusion of two more meetings—one in Indonesia at the end of March, and one final meeting in New York at U.N. headquarters. The communiqué from the third panel meeting in Monrovia indicates that there is agreement among panelists that a development agenda should extend beyond economic growth to focus on equality, sustainability, and reaching populations that were left behind in the Millennium Development Goals. The communiqué emphasizes that any post-Millennium Development Goals global development agenda must include the empowerment of women and girls, the expansion of social protection schemes, and universal access to health care—including sexual and reproductive health. In addition, growth must be inclusive and accompanied by strong institutions and transparent government to protect rights. The next meeting of the High-level Panel will be in Bali, March 25–27, and will focus on methods of implementation. Expectations for the panel giving due consideration to women’s issues runs high. President Sirleaf and another panel member Tawakkul Karman, a women’s rights activist, jointly received a Nobel Peace Prize in 2011 for their promotion of women’s rights and peace. President Sirleaf, a long-time champion of women’s rights, is the first democratically elected female president in Africa. Karman, who became the face of the 2011 uprising in Yemen as part of the Arab Spring uprisings, and is known as “mother revolution,” is at the forefront of the fight for democracy in Yemen. Podesta prescribes an inclusive approach to economic development, one that combats discrimination, provides economic opportunities, and improves the infrastructure—access to energy, property rights, and employment—to allow individuals and families to thrive. Of particular significance to women, Podesta points out that reproductive and sexual rights and land tenure property rights are two components of development. Only between 10 percent and 20 percent of women in developing countries have land rights, and women hold fewer assets and face more difficulty attaining credit. Yet according to the U.N. Food and Agriculture Organization, if women had the same access to land, technology, financial services, education, and markets as men, yields on women’s farms could increase from 20 percent to 30 percent, which would feed between 100 million and 150 million more people—children, women, and men who would otherwise go hungry. Because women account for one-half of a country’s potential talent base, a nation’s competitiveness in the long term depends significantly on whether and how it educates and utilizes its women … in order to maximize competitiveness and development potential, each country should strive for gender equality—that is, should give women the same rights, responsibilities and opportunities as men. Looking forward, there are a number of other intergovernmental processes and civil society engagement processes surrounding the post-2015 development agenda preparations, which will also eventually impact the outcome of these deliberations. There are a number of other relevant intergovernmental processes for the post-2015 development agenda from now until 2015, such as the 2015 World Conference on Disaster Reduction and the 20-year review of the Program of Action of the International Conference on Population and Development in 2014. In addition, world leaders and civil society are gathering at the 57th Session of the Commission of the Status of Women at U.N. headquarters in New York over the next two weeks to discuss how to eliminate and prevent all forms of violence against women and girls, which is this year’s priority theme in line with International Women’s Day. They will also assess progress on the Millennium Development Goals and key gender equality issues to be reflected in the post-2015 development agenda. Besides these processes, the United Nations plans to garner input from a variety of stakeholders, including the private sector, philanthropic organizations, and citizens, as it formulates the post-2015 agenda. Thus far civil society has responded with thoughtful proposals outlining the need to focus on addressing underlying inequalities and how to avoid uneven results. For example, Save the Children’s vision for a post-2015 framework recommends zero-based goals to tackle persistent inequalities, and think tanks such as the Overseas Development Institute are offering similar approaches to ensure the next development approach reaches everyone. Globally, significant economic, social, and cultural barriers remain that prevent women from participating in economic development, which hinders the broader efforts to combat poverty and pathways toward sustainable development. Further progress will require a sustained effort to ensure that women around the world have greater economic rights, including the right to own property, as well as security to ensure they are protected from violence. Establishing these conditions will hinge on international development processes making women’s empowerment and gender equality pivotal to their efforts. Rebecca Lefton is a Senior Policy Analyst working on international climate policy at the Center for American Progress.